January 21, 2016 - Los Angeles, Federal authorities have arrested a former captain with Alaska Airlines on federal charges of piloting a plane with passengers while under the influence of alcohol. David Hans Arntson, 60, a resident of Newport Beach, was arrested yesterday morning and was arraigned on the felony charge yesterday afternoon in federal court in Los Angeles. Arntson was released on a $25,000 bond and was ordered to appear for an arraignment on February 10. According to a criminal complaint filed Tuesday in United States District Court, Arntson was the pilot of two Alaska Airlines flights on June 20, 2014. The first flight was from San Diego International Airport to Portland, Oregon. He then flew a plane from Portland, Oregon, to John Wayne Airport in Orange County. After landing at John Wayne Airport, Arntson was selected for random drug and alcohol testing by Alaska Airlines. A technician for Alaska Airlines performed two tests on Arntson and received results that the pilot had a blood alcohol concentration of 0.134 percent and 0.142 percent. After the technician informed Alaska Airlines of the test results, it removed Arntson from all safety-sensitive duties. According to federal law, a person operating a “common carrier,” such as a commercial airliner, is presumed to be under the influence of alcohol when his or her blood alcohol content is 0.10 percent or higher. Arntson’s co-pilot on the two flights on June 20 remembered seeing the drug tester when the plane landed at John Wayne Airport and recalled Arntson say “I bet it’s for me,” according to the complaint. Following the June 20, 2014, incident, Arntson retired from Alaska Airlines. 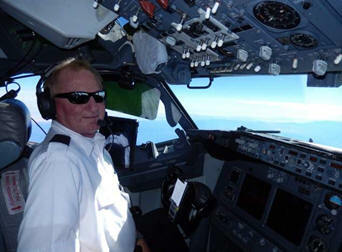 Alaska Airlines in a press statement stated; "Alaska Airlines has an uncompromising commitment to safety and compliance. We put the safety of our passengers and our employees above all else. We have a zero tolerance policy for employees, including pilots, who fail alcohol and drug tests. Mr. Arntson was immediately removed from duty. He refused to submit to an investigatory interview. Mr. Arnston left the company before we were able to complete an investigation that would have led to his termination."